When it comes to taking makeup off, I am the laziest girl - but I never go to bed without taking it off. For days when I have a full face of makeup (which I don't have everyday) I wanted 1 product that would do the job. Whilst at BeautyCon last year I received a free sample of the Liz Earle cleanse and polish hot cloth cleanser - and i've been obsessed ever since! Luckily I was given 3 samples of the product, and since only a small amount is needed each time, along with the fact I only wear makeup twice a week, I haven't yet had to purchase a bottle. I could not recommend this product more highly. It is amazing. The process includes running the cloth under warm water and applying 1 pump (more if desired) to your dry face. After rubbing the cleanser into your skin, including the eye area (which doesn't hurt if you accidently get it in there) you take the warm cloth and wipe it over your skin, using a different part of the cloth for each part of your face - left cheek, right cheek, forehead, chin, and eyes. Wth a matter of minutes, all of your makeup will have come off your skin. It's fab. For girls who have sensitive skin - I also have sensitive and dry skin so I have to be careful of what products I use. However, this product works fine for me. 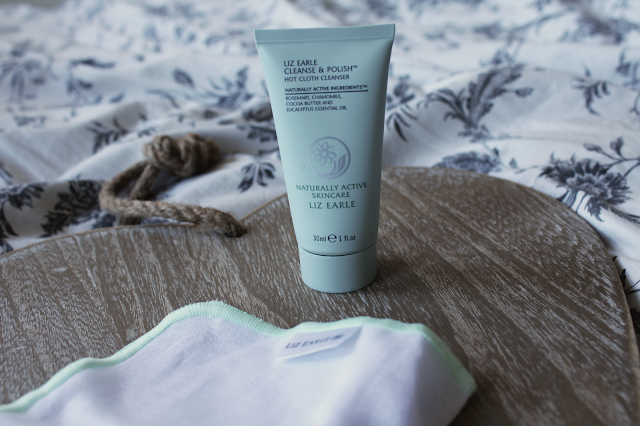 I also purchased the Liz Earle Moisturiser and Toner which work super well too! What do you use to take off your makeup? Have you tried this product? Let me know in the comments below.